The beautiful and magical island of Karlsøy is situated at exactly 70° north and 20° east, “at the edge of civilization”, as a danish journalist once wrote. This is a short summary of the islands general history and the political backdrop for the festival. Jump to the end if you only want to read about the festival. From 1776 Karlsøya became it’s own parish and the island was a center for trade, healthcare, law and religion in the area for many years. The church and the clergy played an increasingly important role in daily life during the 18th century and the priest organized important social institutions such as poor relief and education. The vicar also organized the “Great Weekend” when all the young people in the parish went to confirmation. Many people also gathered at Karlsøy on weekends when weddings where solemnized, as well as the Christmas and Easter weekends when many took communion. The church was, therefore, the centre of social life for everyone in the entire parish. The central role is revealed by the rich church plate which was donated to the church in the 18th century and is still kept in the church. As accommodation during the long church weekends the common people from the neighboring islands and the mainland built a number of small lodging houses near the church. “church cottages”. There where about 20 of them close together along the shore, just below the church and the graveyard. Three of the cottages are still standing. The last church cottages were still used for their original purpose until c. 1920. 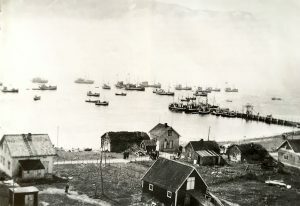 At the turn of the century, Karlsøya became famous as the birthplace of what was later called fisherman-farmer socialism in Northern Norway. The climax was the general election om 1903 when the vicar, Alfred Eriksen, was elected to parliament as one of 4 members of Arbeiderpartiet (The Labour Party). At the local elections in 1904 Arbeiderpartiet (The Labour Party) won in both Karlsøy and Helgøy, and they became the first municipalities in the country to be controlled by the party. The background for this was the long-standing conflict on Karlsøy between vicar Alfred Eriksen and the merchant and mayor, Adolf M. Helberg. This began as a personal conflict concerning prestige and local resources on the island and continued as a struggle for political power in the municipality. 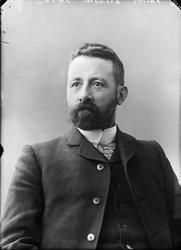 Eriksen won the struggle in 1898 when he became mayor. Later it developed into and ideological struggle against “merchant rule” or the “petty king system” (Nessekongene) both locally and regionally. 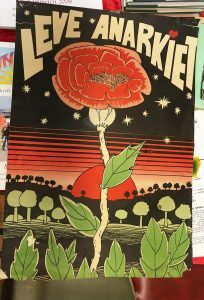 After 1902 the struggle was carried on under the banner of Arbeiderpartiet (Labor Party) with the founding of the newspaper Nordlys and the establishment of a local branch of the party as two important moves. Nordlys was printed in the servants’ cottage at the vicarage (Prestegården) in 1902 – 03 and then transferred to Tromsø. This cottage is still standing and is now owned by Nordlys, which is today the best-selling newspaper in Northern Norway. In 1970 the island community experienced a population crisis. There where now only about 45 people on the island, of whom only 2 where schoolchildren. Most of the adults were elderly people. Those who wished to move received resettlement grants, also known as forced relocation. From being a central island in the region, Karlsøy was now an outer costal district which the authorities were willing to see depopulated. However, a mobilization against depopulation took place and in contrast to other similar places the decline was stopped and people began moving to the island. These were young people who had lost faith in consumer society and in capitalism and who represented a new cultural identity. They were often referred to as hippies. 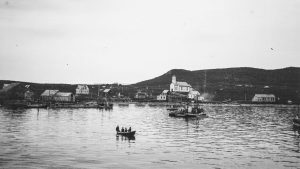 Some came from towns in Norway and abroad and brought the modern world to the island society, something which created conflicts with the older population. There were unusual clothes and strange beliefs, experiments with new ways of living together such as live-in partners and communes, squatters and flower festivals, the cultivation of cannabis and police raids, organized anarchism and a book café, handicrafts and rock’n’roll. All these things were quickly noted by the mass media and the island became famous like never before. 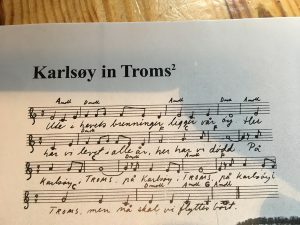 The song “Karlsøy i Troms” put Karlsøy on the map. But not only that, it contributed to an awareness among the population along the entire coast of Norway, an awareness of the possible fate of such districts. However, in the middle of the struggle against the EEC and centralization Karlsøy went against the tide. The depopulation of the Norwegian rural districts was to prove impossible to achieve here. In 1972 young people started moving to the island and made their living from agriculture and fishing. Karlsøy became a symbol of the struggle against centralization and urbanization of the Norwegian society, and a symbol for the people who represent diversity and acceptance of all other ways of being and cultural expressions. Although having been less than 100 inhabitants (while many more have been living here for shorter periods) we have lived through periods of anarchism, socialism, punk, buddhism, Islam and you name it. Since the 70s the island has been a free haven for artists, musicians and radicals in general. During the 70s and 80s the idealistic youth living here experimented with different ways of thinking and self-sufficient living. 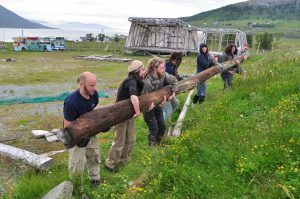 In 2000 the islanders started a festival to get more in touch with political alternative communities and resistance movements all over the world. The festival lasts from Tuesday through the weekend and the first three days consists of political and cultural seminars, and workshops with topical themes hosted by representatives from political and cultural alternative movements from all over the world. Among previous movements we have had visiting are activists from Chiapas, Sápmi, Palestine, Christiania and many more. During the weekend there are concerts on the main stage, activities for children and lots of other things happening to both entertain and educate a larger group of guests since the bulk of the audience arrives for the weekend. 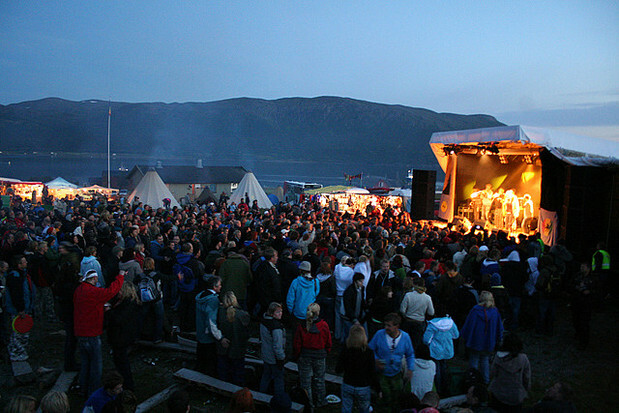 Karlsøyfestivalen is an international scene with guests, volunteers and artists coming in from all over the world so you will feel very welcome even if you don’t speak fluent Norwegian. It can get quite cold in the evenings so make sure you bring some warm clothes! The Karlsøy festival is a special occasion where we gather together to resist and oppose a society with values based on profit, competition and greed. The festival is a protest against razing of the rural communities, environmental destruction and racial discrimination. It is a protest against colonization, exploitation and the brutal oppression of the worlds people. 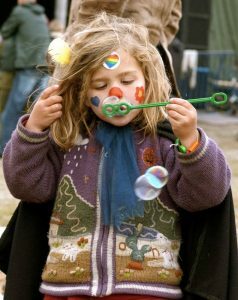 The festival is a gathering and a celebration of all the positive alternative forces. Its purpose is to reflect, recreate and promote these alternative forces which are fighting for a different and better world, a world characterised by solidarity, empathy and love. Every aspect of the festival is inspired by the festival manifest written before the first festival in year 2000.